Right this minute | Anticipating my evening with Greyson and David. Looking forward to seeing what Greyson got at school today. What color behavior checkmark will it beee? We're also continuing some pretty serious pumpkin decorating. This Ninja Turtle is in the works for his pumpkin decorating contest at school. Feeling | Groggy! I slept so great last night. The kind of sleep where you're so knocked out you don't move and you wake up feeling like everything settled to the bottom. I don't think I've really woken up all day. Reading | I just finished my tenth book for #15in31 today! I probably won't make it to 15, but I bet I can get another two or three under my belt. Super excited to have read more this month than usual. Listening | Adele. Adele. Adele. I'm sure you've already heard the new single, but I'm totally in love with "Hello." Watching | The Great Food Truck Race III and The Great British Baking Show. David and I usually have at least one show that we marathon when we're brain dead on weekends. These are the two most recent from Netflix. Blogging | I'll be blogging more since I have all the #15in31 reviews to write! 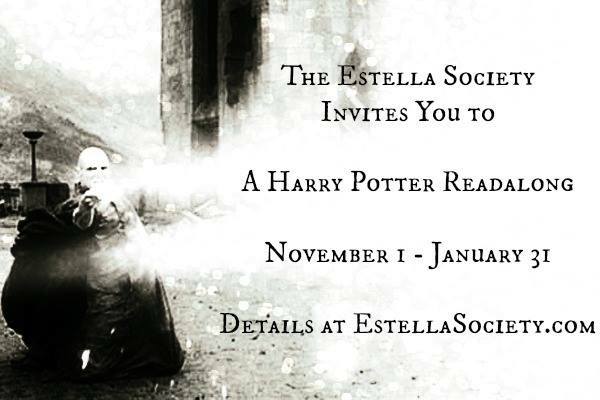 Promoting | WELL, since you mentioned it, I just posted at Estella Society about our upcoming Harry Potter binge! Check it out. Loving | Books, books, books. So excited to be making more time for reading. Hating | I bet you can guess. Eating | Tonight is chicken and dumpling casserole, and I'm stoked. Anticipating | See above! Bring on all the POTTER! Ohhh you reminded me I still need to buy a pumpkin or two to carve! I love the Adele song, too! Its on repeat!! A Ninja Turtle pumpkin sounds awesome! And that HP readalong sounds like just what I need. I've been in such a slump lately, it sounds like the perfect way to help me get my reading mojo back - thanks!! Plus, I've been wanting to re-read them for a while now, so this is just perfect timing. Have a great week!! I haven't heard the Adele song so I'm listening to it now. I clicked on the pumpkin link and they're all awesome! I'll be working on Halloween so I won't be giving out candy but I did buy a costume today! Sounds like #15in31 is a pretty great way to put a spark back in the reading - I'm hoping Nonfiction November will do the same for me next month! Oh, I love the Adele song too. Heard it recently. So you didn't float away this weekend? We did not either, but so much rain. Which is good...and bad for some I guess. I think the drought is over for 2015. A Harry Potter thing sounds fun. I've just been thinking that it might be time to listen to them all again. I have to thank you; I didn't even know Adele had a new album coming out until you mentioned the new single on Twitter. So great. I am so looking forward to the Potter Binge! Been planning one for years but it was just not happening. This year, it hopefully will! Can't wait to read people's takes on Harry Potter in the Potter Binge. I cannot participate because I'm not reading any of the Harry Potter books whatsoever from now on (even little excerpts from them!) until the illustrated editions come out. Chamber of Secrets 2016!! I just saw your pumpkin turtle on FB and I love it!!! Also, I have to listen to this Adele single. I feel like I'm the only person on the planet who hasn't yet. Ahhhh! I don't know if I love the Adele song, but I am looking forward to hearing more from her and that she is back. Can't wait for the new album. That Ninja Turtle pumpkin is very cool! Hope you guys have a great time with all the Potter reading! Yay for Harry!! I have been a walking zombie all week. I'm not certain why either. I hope you have a great week and that Greyson gets all green!